The Galway u-21 footballers picked the ideal occasion to produce an exemplary team performance in defeating Cork by 1-14 to 1-11 in the All-Ireland final on Saturday evening in Limerick’s Páirce na nGael. From Thomas Healy in goal to the scintillating Ian Burke at corner forward, all the starting 15, plus the subs, played their part in collecting the county's fifth u-21 title, and fourth since 2002. The quality and standard of football on display from both teams was top class in what was a marvellous and high quality contest in tough conditions. It was a thoroughly enjoyable occasion for the many Galway supporters who made the trip and the crowd of just over four thousand was made up in the main by maroon and white fans. The game was end-to-end football with little of the cynicism we are very used to seeing at senior level. Some of the score taking was superb. Ian Burke (0-4 ), Cathal Mulryan (0-3 ) and Adrian Varley hit some stunning points from play, and the vastly improved and improving Damien Comer took his goal with conviction. Five of the six starting forwards are underage again next season and it was lovely to see them so sharp and full of vim and vigour. They were extremely efficient and accurate in front of goal and hit their 15 scores from 20 attempts. Shane Walsh hit four points from frees, worked hard too - a player with natural talent. He sprayed some lovely passes to set up a few scores and it was his vision and cross-field pass that helped to set up Comer's three-pointer following a stunning lay-off from the selfless Adrian Varley. While Mark Loughnane, James Shaughnessy, Daithí Burke and Eoin Walsh did some fantastic things in defence and attack, it was the midfield combination of Fiontán Ó Curraoin and Tom Flynn who were the foundation rocks of the success. Ó Curraoin caught some fantastic ball from kick-outs, took down at least six clean catches during the game, and also flicked some valuable ball down to his teammates. The Micheál Breathnach’s man has been a superb captain all year, and the man-of-the-match always looked calm and assured, and exuded confidence. His use of possession was impressive too. In fact, his overall leadership, maturity and ball winning ability was absolutely central to Galway's victory. His direct opponent Seán Kiely was totally outplayed and replaced just after half-time, while Cork's other midfielder Ian Maguire won some good ball at stages, but Tom Flynn who is 6’6" was able to stick with him and nullify his influence. And as the game wore on, Flynn came into things and had a very good last quarter. Both Ó Curraoin and Flynn are on the senior panel( alongside Tom Healy and Shane Walsh ) and are expected to have some game time against Mayo on Sunday week. A word of praise too for the u-21 management team of Alan Flynn and his two selectors, Declan Meehan and Paul Clancy, who had the team in superb shape - physically and mentally. Senior manager Alan Mulholland and Donal Ó Fatharta were also involved alongside fitness coach Niall O' Toole and all played their role in what was a really stunning victory. 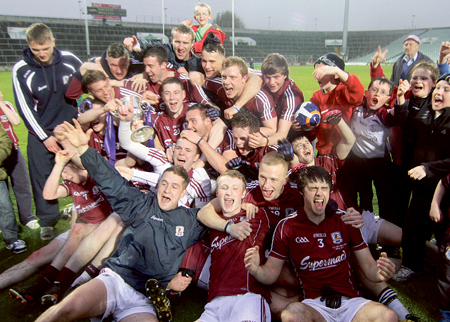 What will this success mean for Galway over the coming years? Cork won u-21 titles in 2007 and 2009 and went onto win the Sam Maguire in 2010 with some of those guys involved. Galway in my opinion are still a long way away from winning any national titles at senior level, but there is a genuine optimism that a core group of players will advance to senior level to help provide the county with more consistency in the senior intercounty arena. Saturday night proved there is talent coming through Galway football. How it is utilised, minded and developed over the coming few years will determine if Galway football is to become a real force at senior level again.